What is the price of holding a birthday party in Jollibee? --- This is the big question that I received from Moms and Dads who want to give their child an amazing Jollibee party. Maybe, that is your question too. 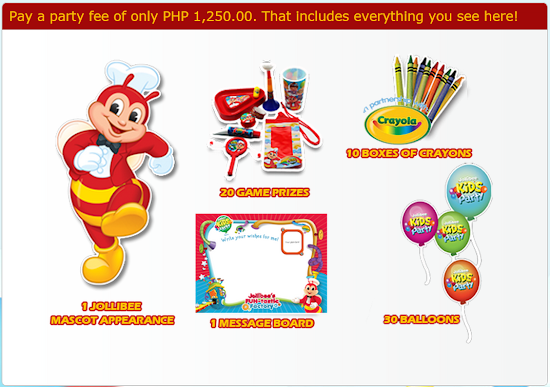 The party fee of 1,250 pesos is included to the Jollibee party package price. It is like the minimum amount that Jollibee requires for the Jollibee party to push through. You will get 20 game prizes, 10 boxes of crayons, 1 message board, and 30 balloons. The appearance of Jollibee is also included in the party fee. Of course you can add more of these party favors if you want. Of course, you can add more Jollibee food items as you please. A birthday party is never complete without a cake! 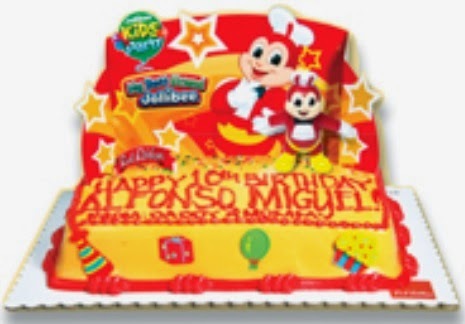 So Jollibee offers cakes from Red Ribbon your child’s special occasion. Medium-sized cake costs 900 pesos while the large-sized cake costs 1,100 pesos. How much is Jollibee Party Package Price for 2016? Assuming that you will only have 30 persons attending your child’s birthday party and also assuming that you didn’t add any party favor, mascot, and Jollibee food item; your Jollibee party will cost from 6,530 pesos to 8,980 pesos. Is the cost of Jollibee party package for 2016 OK or not? Is it expensive? Share your thoughts by leaving a comment below.